This immaculate two-bedroom/one-bath vacation rental is situated on the shores of beautiful Smith Mountain Lake, Virginia. It features comfortable accommodations and stunning wide-water and mountain views! Perfect for a family getaway, Cedar Key Cabin includes one queen-size bed, two twins, a queen-size sleep sofa, a TV, VCR, DirectTV, internet access, central heating and air-conditioning, open beams, and hardwood floors. The home sleeps six persons comfortably.Outdoors there's a deck with a charcoal grill and patio furniture. And there's a shared dock which is great for swimming and boating. Cedar Key Cabin is near the mountains and the Smith Mountain Lake dam. 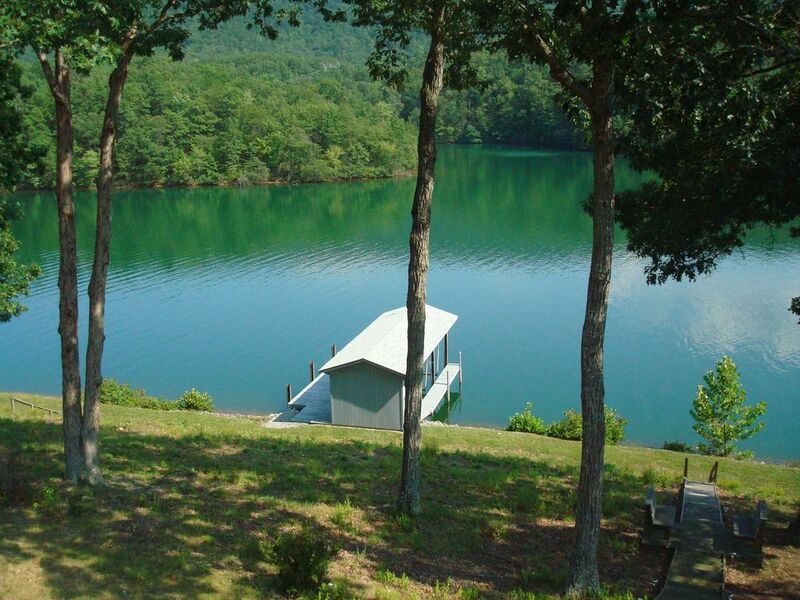 Don't miss out on a fantastic vacation at beautiful Smith Mountain Lake, Virginia! Call us today to make your reservations. Welcome: Cedar Key Cabins are two immaculate vacation rentals (see VRBO 427641) located on the shores of beautiful Smith Mountain Lake, Virginia. In addition to comfortable accommodations, you'll also enjoy stunning wide-water and mountain views! Dog-friendly! : Dogs are allowed on the property and have a wonderful time at the lake. However, please do not leave them alone. Even though your dog may be comfortable alone at home, dogs are often frightened when left in a strange place and can cause substantial damage. Cats are not allowed. Welcome: Cedar Key Cabins are two immaculate vacation rentals located on the shores of beautiful Smith Mountain Lake, Virginia. In addition to comfortable accommodations, you'll also enjoy stunning wide-water and mountain views! Waterfront Cottage near the base of Smith Mountain Lake. Enjoy peaceful days and beautiful evenings on the dock. Very clean beautiful cabin with a great view of lake. We enjoyed our stay. Our experience was very positive. The only thing we saw that wasn’t positive were some ants in the kitchen, which is a very common thing this time of year. We were happy that we found this cabin to rent, and would definitely come again. Very tranquil; lake views were AMAZING! Cabin is comfortable. Rear deck needs some TLC and Internet connection didn’t work. Overall, a great weekend get away. Wonderful cabin owned by wonderful folks! We had a great time and so appreciate the Fosters sharing their rental cabin with us. Clean and comfortable accommodations and breathtaking lake and mountain views. Can't wait to go back! My family and I loved our stay! Very comfortable accommodations on a quiet cove. We found everything we needed for our weekend retreat. Sitting on the deck at night and stargazing was a plus, not often can you see the Milky Way. We'll definitely return. Smith Mountain Lake, Virginia, is truly the jewel of the Blue Ridge. Visit and enjoy mountain and lake views, boating, fishing, golfing, swimming, water sports and relaxation. Kroger & Food Lion grocery stores, Westlake Cinema, Smith Mountain Lake State Park & Mitchell's Marina nearby. Golf: SML offers three public golf courses -- The Westlake Golf & Country Club, Mariners Landing Golf Club and Sycamore Ridge. In addition, there are two private country clubs (The Waterfront and The Water's Edge), which are both owned by The Willard Companies.